Yesterday, the International Violence Against Women Act was reintroduced, in the Senate by Sens. 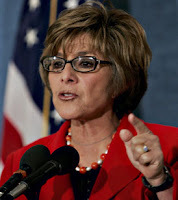 John Kerry (D-MA), Barbara Boxer (D-CA, pictured. ), Susan Collins (R-ME) and Olympia Snowe (R-ME), and in the House by Reps. Bill Delahunt (D-MA), Ted Poe (R-TX) and Jan Schakowsky (D-IL). According to the press release, "This landmark bipartisan legislation makes combating violence against women and girls a strategic imperative for the United States government. IVAWA creates new institutional authorities, responsibilities, and funding to fight the scourge of violence against women and girls around the globe." The legislation was "originally drafted by then-Senator Joe Biden (D) and Senator Richard Lugar (R-IN) in collaboration with over 40 women's groups and 100 non-governmental organizations worldwide." The legislation was introduced in 2007 but never voted on. That cannot happen this time around. Contact your Senators and Representatives and request their support for this important legislation, and urge others to do the same. Amnesty International: "USA to provide effective remedies to violence against women and girls with the introduction of I-VAWA." Also see their I-VAWA page. RH Reality Check: "International Violence Against Women Act Addresses the War Against Women." U.S. State Department's press release. AlterNet: "US: Approve Bill to Curb Violence Against Women."